The change of regime in Afghanistan has fuelled a determined campaign to hunt down the country's remaining snow leopards, conservation groups say. They believe the animals are one of the world's most endangered big cat species. The leopards are threatened by illegal killing and trade across most of their range. But there is some hope that new community initiatives may safeguard the animals' future. The warning over their plight comes from three groups: WWF, the global environment campaign; Traffic, the wildlife trade monitoring network; and the International Snow Leopard Trust (ISLT). In a report, Fading Footprints: The Killing And Trade Of Snow Leopards, they say the cats are estimated to number from 4-7,000. Stuart Chapman of WWF-UK told BBC News Online: "That estimate is based on some reports that are up to seven years old, and the situation has worsened in that time. "The true figure is probably closer to the lower end. There have been credible reports of huge population declines over the last decade across most of the leopards' range. "The trend is downwards. But extinction is not imminent, because their range is so huge and so remote." The animals live mainly in the mountains of central and southern Asia, where there are few predators. They are listed on Appendix One of Cites, the United Nations Convention on International Trade in Endangered Species, which means they cannot be traded internationally. But Bhutan is the only range state where they are not traded, despite the existence of prohibitions on both killing and trade in most of the others. The report says some of the skins and other leopard parts are reaching areas like the Middle East and Europe. Stuart Chapman told BBC News Online: "UN staff have seen leopard pelts being offered for sale in Kabul, especially to foreign aid workers and military personnel. "They sell for up to $1,000, and hunting has gone up sharply since the Taleban went. Before that, there was no market for the skins. "It's very disheartening when you see them on sale. The animals live at such low densities in such inhospitable terrain. 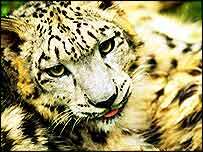 "Every pelt offered for sale is another nail in the snow leopards' coffin, especially if it's from a breeding female. That's why this report is so disturbing." The report says there is also an illegal trade in live leopards and in body parts including teeth, meat and bones: these are used in traditional Asian medicine. 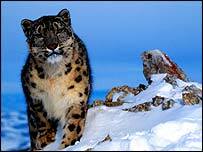 The ISLT is launching an initiative to improve the animals' conservation, entitled Snow Leopard Survival Strategy. Proposals in the three organisations' report include stricter legislation and better enforcement in the range states, and economic incentives to encourage people to reduce conflict between their herds and the snow leopards. In Mongolia WWF is supporting a non-profit handicraft enterprise that offers herders a chance to earn more in return for protecting the animals. 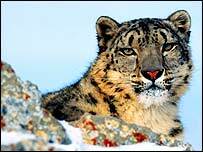 Snow leopards are found in Afghanistan, Bhutan, China, India, Kazakhstan, Kyrgyzstan, Mongolia, Nepal, Pakistan, Russia, Tajikistan and Uzbekistan. Threats include not only hunting but loss and fragmentation of habitat as herders encroach on the leopards' fastnesses. This in turn causes a lack of genetic diversity which can result in diseases and birth defects. 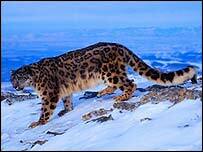 And in countries where extreme poverty is common, snow leopards are an understandably tempting target. Images courtesy and copyright of WWF-Canon and named photographers.